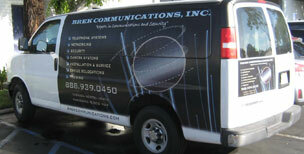 Welcome to BREK Communications, Inc.
At BREK Communications, we are experts in communications and security. We have more than 25 years of experience providing quality, affordable telephone, IP, and security system services throughout Southern California. We offer comprehensive design, installation, repair, training, and support services, and we work with your telephone service carrier to provide you with seamless, fully integrated service. You can rely on our extensive experience and our professional expertise; we are a Microsoft-certified partner, and a factory-authorized installer for all the major brands in communications, including Toshiba, Star2Star, Telco, Nortel, Cisco, and Panasonic. In addition, our rates are extremely competitive; on average, our services cost about 30% less than those provided by your phone or cable carrier. We have a long list of satisfied clients that include auto dealers, insurance agencies, medical offices, retail stores, restaurants, real estate offices, banks, call centers, and more. We specialize in serving small to midsize businesses (from 5 phones to 500 phones), and you can rely on fast response time for all our services. A BREK employee will respond to your installation request within 24 hours, and our technical support services are available 24 hours a day, 7 days a week, 365 days a year. We try to save you a service visit whenever possible, so we offer reliable phone support to troubleshoot any technical problems. If your problem does require a service visit, we will send a technician who is familiar with your specific system, and we send the same technician whenever possible. In addition, our repair services are backed by a 100%, risk-free guarantee. Call us today; we offer free site surveys and estimates for all our services. You can rely on our experience and expertise; BREK Communications is Southern California's complete resource for phone, data, and alarm services.